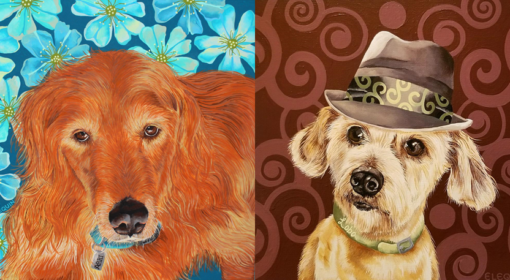 Immortalize your beloved pet with a custom pet portrait. 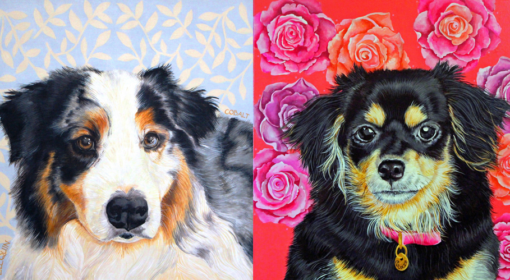 My pet paintings are one-of-a-kind & unforgettable!! 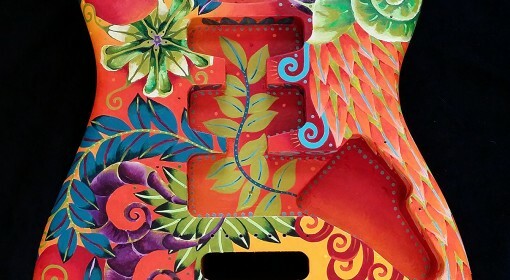 I incorporate colorful & vivid backgrounds … everything from brilliant flowers, bold geometric designs or whimsical imagery. Match the design & colors to your interior space or incorporate a detail that is particular to your sweet pet. Working from photographs of your pet, I create a unique portrait capturing the special characteristics of your loving pet. Each portrait depicts the name of your pet on the collar or in the background. I use only heavy weight cotton duct gallery wrapped canvas with 1.5” wood frame profile, kiln-dried beveled stretch bars & cable-locked canvas. These canvases do not have to be framed since the painted images are taken over the sides of the painting. Want a smaller painting … ask for the canvas boards starting as small as 4×5 inches. See more of my pet portraits on Facebook or Instagram. This skull used to be a clock! All the clock components were removed leaving holes and an aged uneven veneer. I sanded the surface and put down a new veneer, filled holes and sculpted a missing tooth. Now it has a new and improved purpose and will be heading to Gilmer, Texas – its new home! You can see additional images of this skull on my Facebook and Instagram pages. Now, I’m finishing a tattoo sleeve and them I’m onto more skulls. Life is good and I am blessed. Stay tuned for more photographs. I will have several works hanging in the home of artist, Mary Bonner. Coincidentally, some of her prints are being exhibited at the San Antonio Art League Museum through February 5th. A Short History of Bonner Garden: The Bonner House was built in 1910 by noted Architect Atlee B. Ayers for the Bonner Family. The family moved to San Antonio from Louisiana after the death of Dr. Bonner, who had amassed a comfortable fortune in cotton farming. Mrs. Bonner and her three children- Mary, Emma and William- loved the ambience of San Antonio and wished to make it their permanent home. So with the resources available to them, they built their home. 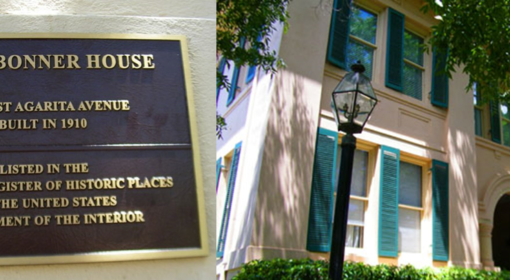 The house was patterned after an Italian Villa built in the early 1600s and it made history when it was completed in 1910. Mr. Ayers established a construction precedent by building this home of concrete reinforced with steel and clad in stucco. It is believed that Mary Bonner was instrumental in incorporating an Italian flavor in the home including the use of Italian tiles, fireplaces and fixtures throughout. Mary Bonner became internationally known for her innovations in printmaking and her own Texas motif sketches. She spent a good deal of her adult life in Paris, but returned to San Antonio where she was active in promoting the arts until her premature death at the age of 48 in 1935. I started painting my doggies just for fun and one thing lead to another and I now find myself painting a LOT of dogs!! I don’t post these paintings to my website but you can see them on my Instagram and Facebook pages. My paintings capture the personality of the pet – sometimes including a detail that is only known to the owner and pet. For example, I was asked to place hotdogs in the background of one pup name Dr. Watson – because that is what the owner resorted to saying when she wanted to get his undivided attention. I loved that. Another portrait of a loyal pit bull named King Louie depicted him with a gold crown and collar to honor his name. I work from photographs of the pet and can create a painting small or large. Contact me if you have a beloved pet you would like to immortalize!!! The Texas Wildlife Association Convention is coming up next week at the JW Marriott Hill Country. 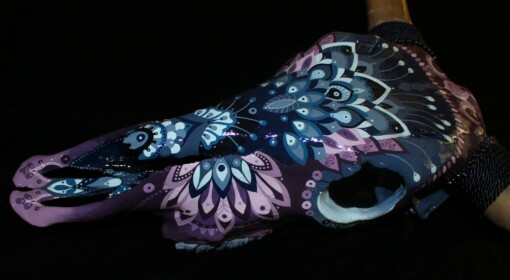 I will be showing my hand painted skulls. Longhorns, steers, goats, bobcats, coyotes. Please come by and see me!!! Bring your own trophy skull and I can customize it to fit your space. Robert Taylor Acoustic Guitar by GZ Guitars & Elizabeth Elequin. The Robert Taylor acoustic guitar is complete and it is simply stunning. See more views on my Facebook and Instagram pages. Thank you Glen! As always your work is impeccable. This midnight beauty is heading to the La Posada de Santa Fe Resort in Santa Fe, New Mexico. The horns are small but the design is intricate and utilizes every inch of space. I typically gravitate towards warm colors – reds and oranges make me sooooo happy – but I have to admit I love the colors of this skull. The midnight blues and eggplant purples are muted but still intense and robust. This is my first Robert Taylor acoustic guitar. It was such a delight to paint. The Stratocaster guitars – which is what I usually paint for GZ Guitars – are very curvy with soft edges but the acoustic was a nice change with its flat surface and larger paintable surfaces. I envisioned a deep deep blue for the background… a blue that would juxtapose the vivid yellows, pinks and purple jewel tones of the foreground. It now heads to GZ Guitars in Florida for the build out. I can’t wait to see the finished instrument! Yes, it has been awhile … where do I start? I’m now showing a couple of pieces at the Blue Hour Gallery in Cambria, California! I will be showing in Georgetown, Texas in the spring. 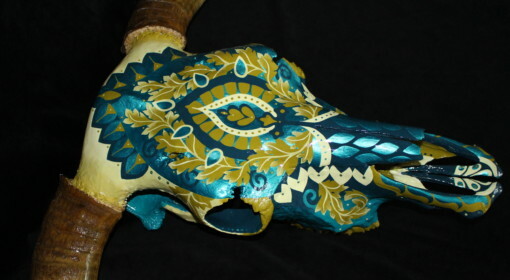 I’m returning with my skulls to the annual Texas Wildlife Convention in San Antonio next July. I have worked a handful of skull commissions and absolutely love to see what my clients bring me – javelinas, angora goats, etc. I have completed the first of a new rose skull series. 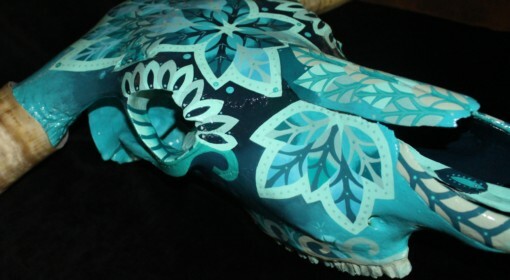 I decided to approach the skulls differently … taking my flowers from my paintings and placing them on the skulls rather than using a decorative approach. 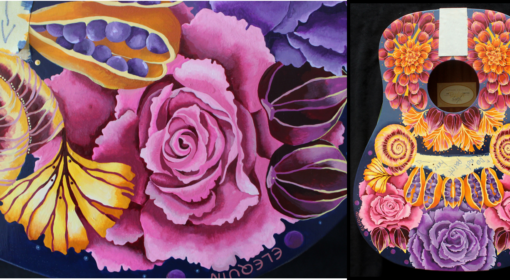 The skulls allow me to give a macro view of the flowers and the 3 dimensional “canvas” makes the roses touchable. 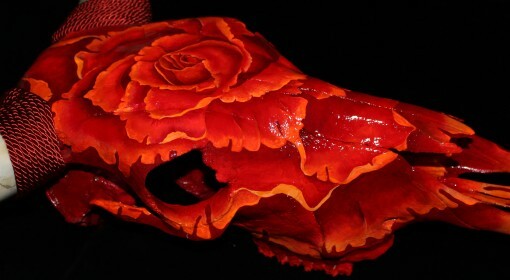 I finished the red rose on the steer skull and am now looking at a deer skull trying to decide what colors to use. Stay tune for more rose skulls! This is my first custom guitar for GZ Guitars!!!! 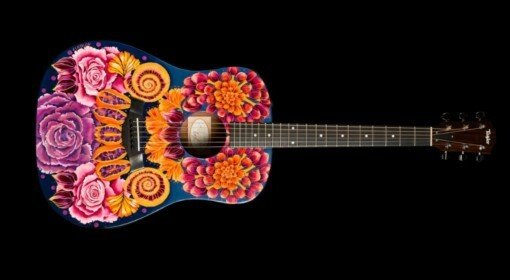 Stay tuned for images of the finished instrument or check out their website: www.gzguitars.com. I’m feeling blessed to have this opportunity to work with such an innovative and creative company. You can also see detailed images for this piece on my facebook page.